The economic development of many countries depends on an institution now fifty years old, the World Bank. Often criticized and blamed for politically unpopular policies, and confronted with numerous setbacks, the Bank is experiencing a difficult time with regard to which strategies to adopt, in particular in Africa. Uganda, a country that emerged from the dictatorship of Idi Amin and years of civil war with relatively high rates of economic growth, is one of its "model cases." OUR FRIENDS AT THE BANK looks at the relationship between the Government of Uganda and the World Bank over a period of 18 months, filming with unprecedented access events at the highest levels of both, and their many encounters and exchanges. High-level teams set up by the Bank's new President, James Wolfensohn, and by Uganda's President, Yoweri Museweri, confront each other. The stakes are enormous. The Bank defends, as does its sister organization the International Monetary Fund, an ultra-liberal economic and financing philosophy which poorly matches the priorities, and above all, the ferocious desire for independence of the Ugandans. While Uganda feels a need to increase military spending to fight a violent insurgent movement, the Bank answers to donor countries and asks for details and explanations. In economic development policy the government favors investment in "hard infrastructure" such as roads, while the Bank argues for prioritizing education. The film also shows how the IMF can weigh in as a third voice, in bilateral discussions with the World Bank in Washington, or directly with the Government on issues such as economic projections and how they affect development financing, tax rates and policies. Finally, and contentiously, OUR FRIENDS AT THE BANK shows how accepting aid from these world agencies involves implementing the larger economic philosophy of free trade, and often reluctant and painful privatizations. But do the Ugandans have any choice, faced with enormous debt weighing heavily upon them, and the realities of the global economic system? 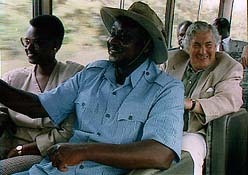 Traveling between Washington, DC and Uganda, Peter Chappell followed the negotiations between the World Bank and Uganda in order to understand and describe the mechanisms that shape the reality of North-South relations, economic and political policy, as well as the future of millions of people. Multifaceted portraits of Ugandans in both public and private spaces. An observational and contemplative documentary.